When my oldest son was a senior in high school and experiencing the heartbreak of being overlooked by college recruiters because he didn’t throw hard enough, I asked nearly every baseball guy I knew how to teach velocity. Most had the same answer – one that parroted the words of the most well known pitching “guru” of the time. In other words, if you didn’t win the genetic lottery you could never hope to be a member of the rare club of high velocity throwers. It was elitism at its finest. As it turned out that was all a bunch of balderdash! I dug into the research. I learned how to teach velocity. I taught it to my own son, and I’ve used the information gained to help 162 others throw a baseball 90 mph (measured on indoor mound, on a live pitch, with a calibrated Stalker 2 radar gun). 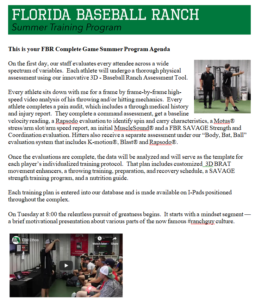 Combining my physical therapy background with the baseball knowledge I had accumulated through my experience as a Division 1 college player and a coach of 20+ years, I designed a system for creating individualized training plans that would help young men develop their arms while limiting their risk of injury. I was one of the few instructors in the country able to infuse baseball development with medical principles of tissue adaptation and safety. The baseball universe has changed. Now there are dozens and dozens of programs claiming to be able to add velocity instantly. A few physical therapists and medical professionals have also gotten into the mix. On nearly every corner you can find a “velocity enhancement program. The internet is replete with “Johnny-Come-Latelies” claiming to have the found the magic solution to the velocity puzzle. But the injury epidemic continues to spiral out of control. Some velocity programs are actually quite good. But frankly, others are extremely dangerous. Engaging in the wrong velocity enhancement program could be like playing with a loaded gun. Here are a few red flags that should alert you to a program’s inherent risk. 1) If everyone in the program does the same thing… RUN!! One-size-fits all programs will work for about 20% of involved participants. 60% will remain neutral or se no improvement, and 20% will regress in ability or get hurt. 2) If the program doesn’t include a physical evaluation by a trained medical professional, it is reckless and dangerous. As I gather more knowledge and understanding of the dynamics and dangers of elite throwing, it baffles me that anyone can recommend any mechanical adjustments, design a throwing plan (including long toss, and weighted balls), create a weight training plan, or make any effective decisions about recovery or workload without first examining for physical or structural related variables. Many times as coaches, we ask a player to perform movements or tasks of which he is physically incapable. If we haven’t assessed him physically, we have no way of knowing what his capabilities or limitations may be. And we may be putting him at increased risk of injury. 3) If the program touts fast results, beware! Soft tissue adaptations take about 6-12 weeks. If you gain velo quickly, the improvement can only be attributed to neurologic adaptation. If the rate of neurologic improvement exceeds the rate of physical adaptation you are highly vulnerable to injury. 4) If the program does not consider periodization, cycling, and recovery as integral variables, it might be dangerous. So what is a young player supposed to do? You know you need to add some mph to get you “on the radar” for recruitment at the next level. If you don’t do something your career will fizzle out due to sub par ability. But if you get involved in the wrong program your career could end with a catastrophic blow out of your arm. Are you willing to search the internet and play “Google Roulette”, hoping the program you find it won’t have a live round in the chamber and the safety off? Or would you prefer to go with a proven, medically grounded training process proven to be effective and as safe as possible? Our Winter Off-Season Training Program begins Dec 5th and runs through Jan 20th. 3-5 hours per day of world-class training designed specifically for you. Join us for a week, 2 weeks or up to 6 weeks to get your ready for the upcoming spring season. evaluation (using our Rapsodo technology), a performance audit, a body comp/nutrition profile, and a mental game evaluation on your first day. Then we’ll design a customized multi-faceted training program based on the results. By the time you show up to campus for your first day of spring practice, you’ll be feeling better and playing better than you ever have. You’ll have earned your success, cashing in your sweat, effort and commitment for the dominance you’ll enjoy. Your coaches, teammates will marvel at your preparation and your performance. Your opponents will rue the day you chose change over status quo… action over hope… excellence over comfort and complacency. When the season ends successfully, you’ll look back on this day as the time you made one of the best decisions in your baseball career — the decision to train at the Florida Baseball Ranch. Click here right now to learn more or to get registered for your winter off-season training. Or call us at 866-STRIKE3 (866-787-4533). Can’t make it for a week? No worries… Call us and schedule your Precision Strike One Day Evaluation and Training Session. Our next Elite Performers Boot Camp is scheduled for Jan 21/22. 15 hours of the most comprehensive and life changing instruction you’ve ever seen. Click here to find out what prior attendees are saying about this incredible weekend experience that can only be described as 2 days of amazing! Hi Rene, we have no such program It was a hypothetical.